A jolly smiling sun and moon are surrounded by a lively mix of swirling stars, crowning the top of this groovy incense burner. 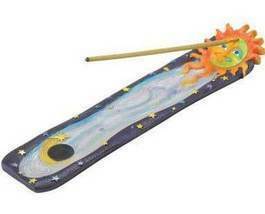 The oblong tray handily holds your favorite stick incense in the optimal position and neatly catches ashes as they fall. Poly resin. 10" x 2" x 1/4" high. Incense not included.